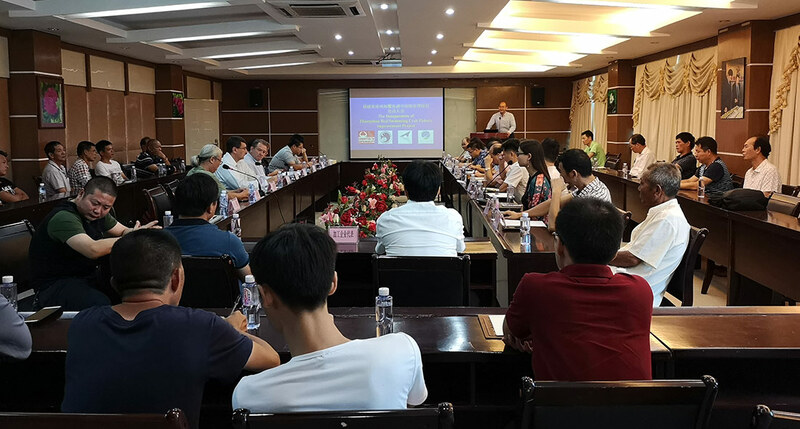 August 8, 2018 Dongshan, Fujian Province, China – Leading United States and Chinese seafood industry groups, fishermen, and sustainable seafood groups came together today to celebrate the much anticipated launch of the Fujian Zhangzhou Red Swimming Crab Fisheries Improvement Project (FIP). The FIP–led by the National Fisheries Institute (NFI) Red Crab Council, China Aquatic Products Processing and Marketing Alliance (CAPPMA), Zhangzhou Aquatic Products Processing and Marketing Association (ZAPPMA), and Ocean Outcomes (O2)–is the first project of its kind in China and will work to address the sustainability challenges of the region’s red swimming crab (RSC) fisheries, whose 1,000 plus trawl and pot vessels catch approximately 40,000 metric tons of red swimming crab annually. As China produces 35% of the world’s seafood (wild and farmed combined) and is home to 25% of the world’s commercial fishing capacity, China’s first crab improvement project, and the largest improvement project by volume in China, is a positive step towards more sustainable fishing practices globally. “That the leading industry associations, from the world’s top two seafood countries, have adopted a formal roadmap for transitioning the fishery to sustainable management, with Chinese government support for the work, is big news,” said Ocean Outcomes’ Songlin Wang. The FIP will be guided by a five year improvement work plan designed, in part, to establish bycatch monitoring protocols, and to move the fishery towards a science-based catch management strategy, such as utilizing a minimum harvestable crab size and protecting egg-bearing females. A portion of the FIP’s pot fleet will also be the special focus of the Fujian government’s national fisheries management reform pilot, where government funding will be invested in important management measures within the development of a comprehensive harvest strategy. With universal, transpacific support, the FIP has a unique funding model through which NFI Red Crab Council members invest two cents of every imported pound of RSC meat towards the improvement project. “It’s a perfect opportunity to leverage government support, international and local expertise, fishery and community engagement efforts, and conservation investments to test innovative improvement models to scale up the sustainability of Chinese fisheries and seafood industry, starting with our RSC fishery,” said CAPPMA President Dr. He Cui. Learn more about the Fujian Zhangzhou Red Swimming Crab Fisheries Improvement Project (FIP).